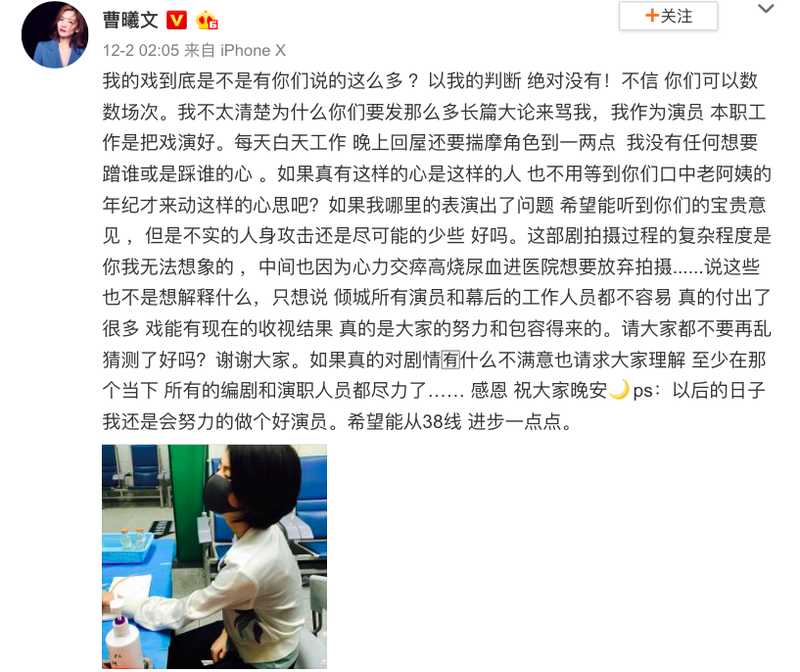 Our Glamorous Time 你和我的倾城时光 has been trending lately for the wrong reasons. Many viewers have been complaining about the lack of screen time for the main leads Zhao Liying and Jin Han and pointing out that too much screen time has been given to supporting characters played by Cao Xiwen and Zhang Junning. Much of the criticism is specifically directed at Cao Xiwen from viewers who claim that her character Grace has edged out Zhao Liying's Lin Qian for screen time. Cao Xiwen took to weibo to respond to her bashers online, "Are my scenes really as many as you say? Based on my judgment, definitely not! If you don't believe, you can count the number of scenes. I am not sure why you will write such long posts to insult me. As an actress, my job is to act well. Working everyday from morning until evening and studying the character until 1 or 2 in the morning, I have no intention to smear anyone nor the heart to step on anyone. If I am really such a person, then I won't have to wait until I became, based on your words, the middle-aged auntie, before trying such tactics. If there is something wrong with my acting, I hope to hear your valuable opinions, but please lessen the personal attacks. The amount of complications during filming is unimaginable. Got sick with fever and hematuria from emotional exhaustion, was sent to the hospital and wanted to give up on filming...... Saying this is not to make an excuse, but just to say that every actor and staff in Our Glamorous Time had a difficult time and gave a lot. For the drama to achieve the ratings is really through everyone's hard work and consideration. Please don't make wild guesses, okay? Thank you everyone. If there is really dissatisfaction over the storyline, request everyone's understanding that at the time, the screenwriter, the actors and the staff have tried their best..... Thank you, have a good night. P.S. In the future, I will continue to work hard to be a good actress, hope to move a little forward from the 38 (a derogatory term that she's been called) line." Not surprised. It was supposed to be a 30 episode drama. But then they got greedy and added more unnecessary episodes as a cash grab. Happened to Ashes Of Love and plenty of other dramas. I wish they’d make a cut version of how the drama would’ve went without the extension. i just decided to drop it yesterday. not only the second leads have more screen time which seems to be a common prob after Ashes of love, the story is going downhill. i went from watching the full ep to wanting more to skipping and finish 2-3 eps in an hour. it went bad after they got together. and i know it's a drama but some stuffs are so unrealistic to the point of being ridiculous. farewell to another cdrama that had a good start but went down hill. i dont blame the actors, it's whoever from the production that thought extending it is a good idea. it is not. This actress has no fault. If you want good ratings then you need good main leads with good acting skills. I am personally sick and tired of C-Drama that use big names to promote a drama as lead stars but their screen time says otherwise. Even in Sori, Zheng Shuang new drama, she appears like 5 mins each eps only. What is the point of it all. It is such a con.I hate how China just use such methods to make money and kill their own industry. Acting with ZLY means, everybody has to share 10% of screen time while she needs to take 90%. Meaning, you only need to appear 2-3 times at most throughout the series. I think everyone should understand that by now already, ZLY is the one and only drive for the entire drama. Fans are not even looking for a storyline, just ZLY alone. When Ming Lan come out, there will be even more characters so there will be even less ZLY screen time. Happy watching till then and we will see this type of ranting again. I am only interested in Li ZiCheng and Lin Qian. The other characters are unglamorous, and could relocate to another drama. Of course, ZiCheng's security team should remain behind. The fashions and haircuts are shocking. Boss Chen's patterned outfits and Ning's double-breasted two sizes too-small business suits, and the lack of socks, leave me aghast. I thought that this drama was ending around 50, but Viki has placeholders for 58 episodes. Why? This drama should have three dozen episodes, if any.